Few natural phenomena generate as much excitement as the yearly changing of the leaves from bright green to pale yellow to deep russet. OK, maybe this year’s solar eclipse has fall beat, but that’s it. 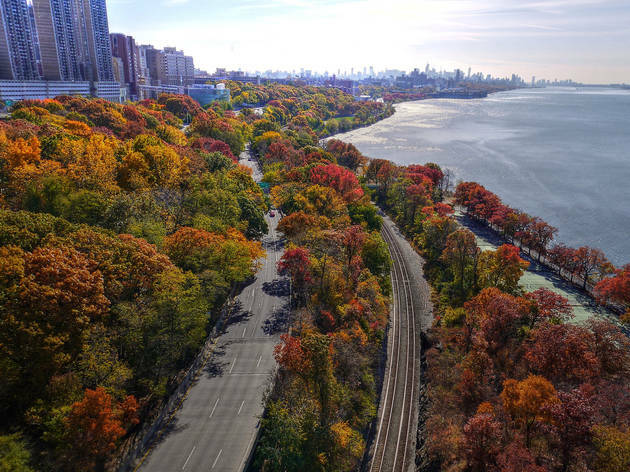 While the trees in Central Park are nice, New Yorkers looking for the best leaf peeping experience will want to get out of the city and take a look at the gorgeous trees lining the Hudson River. Luckily, there’s no shortage of fall foliage boat cruises to help you get your fix of changing leaves. Climb aboard one of these four cruises for the fall excursion of your dreams. For the ultimate fall day trip, board a Circle Line ship at Pier 83 for a cruise north to Bear Mountain State Park. There are plenty of photo opps on the route: You’ll pass the stunning cliffs at the Palisades, the Little Red Lighthouse and the George Washington Bridge. Once you arrive at the state park, you’ll have three hours to explore the hiking trails, museums and bird refuge before it’s time to head back to the city. An on-board Oktoberfest featuring seasonal beers, traditional German dishes and a live polka or oompah band completes the festive atmosphere. Don’t have a full day to spend admiring the changing colors? Reserve a seat on the brunch cruise aboard the 1920s-style yacht Manhattan. This cruise follows a much shorter route, leaving just enough time for you to admire the gold, red and russet-hued leaves of the Palisades. Your ticket also includes a brunch buffet with a complimentary mimosa, Bloody Mary or glass of sparkling wine. Sail away on the Classic Harbor Line’s schooner Adirondack for a breezier leaf-peeping experience. Your captain will unfurl the main sail and take you up the Hudson River and along the Upper West Side of Manhattan to pass the Palisades before turning south. Munch on an assortment of sandwiches and sip beer and wine while you admire Mother Nature’s handiwork. Anchors aweigh! 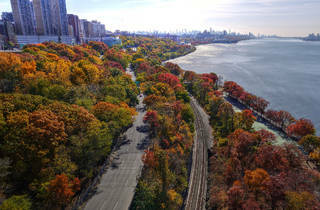 You’ve got to go across the river to Weehawken, New Jersey to board Majestic Harbor Cruises’ leaf peeping cruise. But if you’re looking for an Instagram-worthy day party, this is the option for you. A DJ will be spinning live music as you snack on a buffet lunch while voyaging north to those picturesque cliffs at the Palisades. Wine and cocktails from the cash bar only make the views sweeter. And if you really want to ball out this fall, you might want to check out even more luxe day trips like a Hudson Valley leaf peeping tour by helicopter or a fall foliage, wine and cheese tour from Beacon, New York.